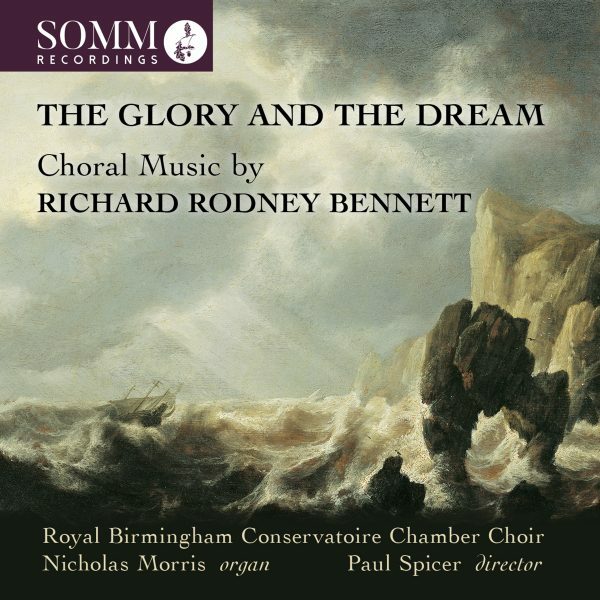 Somm Recordings celebrates the sublime choral music of Richard Rodney Bennett – best known to a wider audience for his Academy Award-nominated scores to the films Murder on the Orient Express and Far from the Madding Crowd – with 11 first recordings and a vivid new recording of his choral masterpiece, The Glory and the Dream. Performed by the Royal Birmingham Conservatoire Chamber Choir, directed by Paul Spicer and with dexterous support from organist Nicholas Morris, The Glory and the Dream features 12 varied and vivacious choral pieces composed over more than 50 years. The disc’s striking title work sets Wordsworth’s ode Intimations of Immortality to music that conjures childhood rapture and adult fears with the utmost finesse and feeling and features a fearsomely complex and challenging organ accompaniment. Dating from 1961, the earliest pieces here are Two Madrigals in which Bennett treats the rich ornamentations of the 17th century to a wholly modern perspective. The most recent work, One Equal Music – a sinewy, austere anthem with a serene ending – was completed in February 2012, just 10 months before the composer’s death at the age of 76. Bennett’s fascination with the Elizabethan and Jacobean eras is also to be found in the elegiac partsong A Contemplation Upon Flowers, the vocal fanfare This Day and Time, a sombre meditation on the finality of life and lasting effulgence of Christ’s eternal being, and the simple but affective carol I wonder as I wander. Other seasonal pieces include the early, plainchant-infused The Sorrows of Mary, the gentle ‘hush song’ Lullaby Baby and late, substantial Remember, O thou man, a fervent and heartfelt prayer ending in quiet contemplation. Previous Royal Birmingham Conservatoire Chamber Choir recordings on SOMM have included admired recordings of choral music by Herbert Howells, Samuel Barber and John Joubert, together with partsongs by Ireland, Delius and Stanford.